When the workshops and assimilation of how to create regional innovation was completed in Tokyo, it was time to go and put what we learnt into action. We will travel to Tohoku region, an area hit by the tsunami (3.11) caused by the Great East Japan Earthquake of March, 2011. There, a group of 24 brilliant High School students will await us to learn how to use the regional resources in their city to create innovation. In anticipation, I wondered how I could relate and teach High School students how to create regional innovation considering I learnt it a few days ago. Saturday morning, and everyone treaded down to the local train stations that conveyed us to the bullet train station. The bullet train, Shinkansen (in Japanese) travels at a ground speed of about 325 km/h. After about 3 hours of travel time, we dragged our feet out of the train station and headed for the buses waiting to convey us to Otsuchi town. Otsuchi town was almost decimated by the 3.11 tsunami. We stood with our faces painted with compassion as a tour guide narrated to us how it all happened. On the unfaithful day, some of the residents have wrongly gathered at the Mayor’s office when they felt the ground shook. A good disaster evacuation procedure preaches that you run to a higher ground when the tsunami is expected. Unfortunately, the tsunami walloped the entire people together with the mayor. The aftermath of the disaster left huge cracks about 20 mm wide on the wall. Much more than an anticipated tensional cracks structural engineers normally design against. Japan has been championing the design of earthquake resistant structures for long. However, no one saw that coming. There is an interesting story about how 99.8% of some Elementary and Junior High School students in Kamaishi City evaded the danger and helped other villagers along. This story is now known as the Miracle of Kamaishi. We left Otsuchi town for Tono City. After 2 days in Tono City, our sole aim of being there was about to start. We were assigned 5 students to teach how to create regional innovation. We sat round a small table with Mai (Japanese), Neysa (Indonesian), Naka Chan (Japanese) and Professor Alex (British) discussing how to accomplish our goal. We were stuck on what best innovation teaching method we should employ to teach the students. It became more difficult as we envisioned that the High School students might not comprehend all what we will teach them. As we thought. We need to take it slowly with them. And the phrase “do not underestimate High School students” was born within us. We joked with the phrase constantly in order to reinforce our belief in the students. Thereafter, we simply concluded they are smart and will perform duly. And we were right. All the 24 students wowed all the university participants with their creativity. They came up with many different innovative ideas that harnesses the resources of Tono City. I was more than impressed and captivated by their creativity, elocutionary skills (they spoke in Japanese though) and their emotional individual reflection and farewell speech to us. Behind, L-R: Professor Alex, Naka Chan, Akihiro, myself, Gonzalo. Front, L-R:: Neysa, Ryo, Rey, Mayu, Kanami, Kana, Mai. The quote by the famous Italian Philosopher, Engineer, Physicist etc. mentioned at the beginning of this piece signifies what I took out most from my Innovation Camp in Japan. In my own words, it helped me realize the great potential for innovation lying both in my hands and existing in my environment. It is truly unlocking hidden potentials. 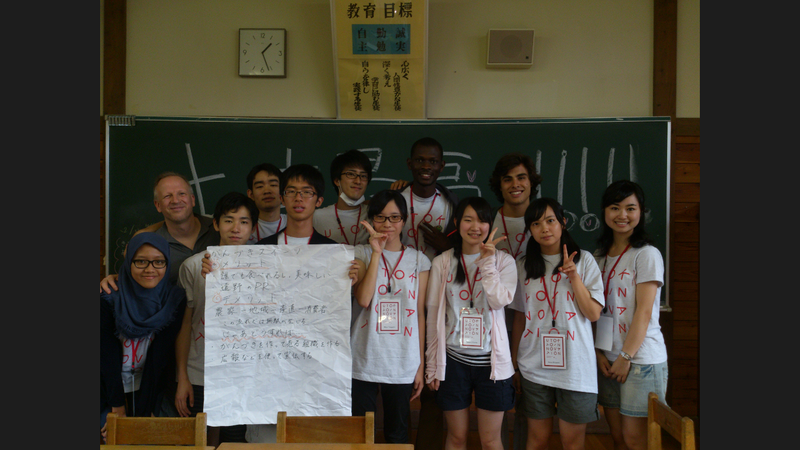 Previous PostCreating Regional Innovation in Japan: Part 1Next PostVolunteering beyond any other experience: my AIESEC exchange programme.